Summer is the time of popsicles, smoothies, ice cream, gelato and whips!! Have you been to Disneyland, or heard of the legendary foods there? We were a family of 6 kiddos and so buying any food in the park was almost out of the question because it was so expensive. A few little treats and snacks would be brought in and my parents are pros at packing a lunch to bring. Now that I am grown I totally admire them and think they are the most thrifty and fun folks ever. But, on those special times where we did get to buy a little something at the Disney Park it was treasured by all the tastebuds in the family. Often because only one or two of the item would be bought and shared between us all. So needless to say when we got to try the famous Dole Pineapple Whip we relished every cold bite. Here we have a copy cat recipe that will satisfy your cravings all year long. 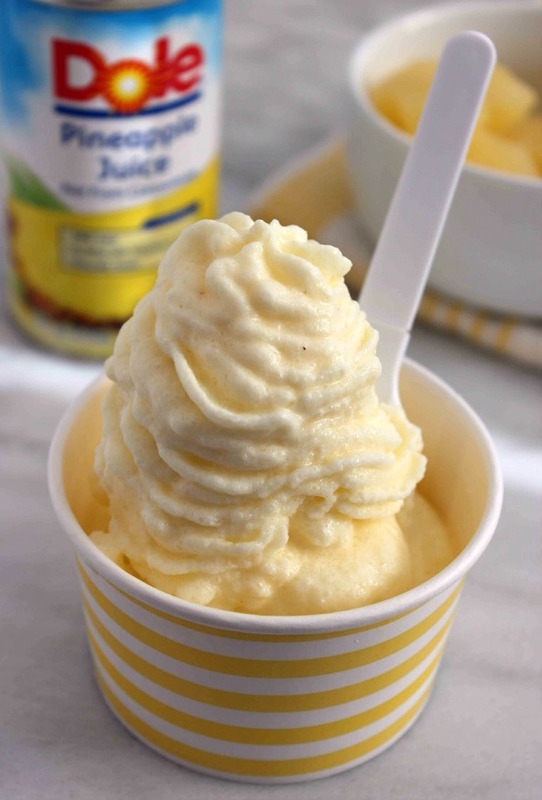 Thanks to the great Pinterest no Disney trip is needed, or empty piggy bank, to enjoy a dish of this yummy pineapple flavored non-dairy frozen treat. Also another great perk, no waiting in line for close to an hour to enjoy a dish of their famous Dole Whip. This stuff may be worth an hour wait in line, but now you can make it quick and easy on your own! When I was young I hated pineapple. Can you believe that? I wouldn’t eat it fresh, canned, cooked, in a smoothie or anything. I just was not a fan of that flavor at all. Now that I am grown I can’t believe I once hated this amazing fruit. There are so many flavors of whip and cool treats, but somehow pineapple is one that tops the charts for many. Most believe that you can only find Dole Whip at Disney but that is not the case. Some Ice Cream stands serve up the tasty treat. The problem is that you have to find them. There are also tons of popsicles that now have pineapple. 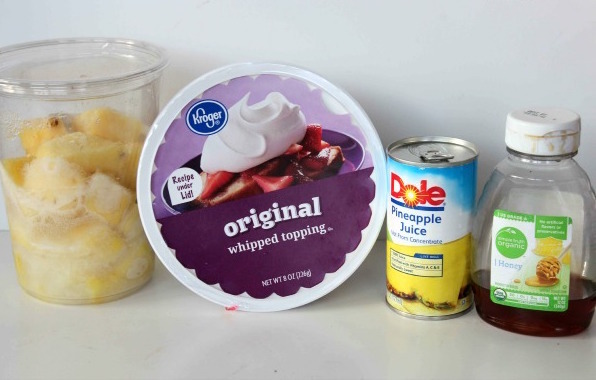 But you can pass them all by and just whip up your own Dole Pineapple Whip now in your home whenever you wish. I hope you enjoy this cool treat as we close summer and enter into fall. There is no better way to kiss summer goodbye and welcome a new season. What is your favorite Disney food? I’d love to hear some of your food memories from the happiest place on earth! Too look more like a creamy whip, transfer mixtore to piping bag with star tip and pipe into cups.